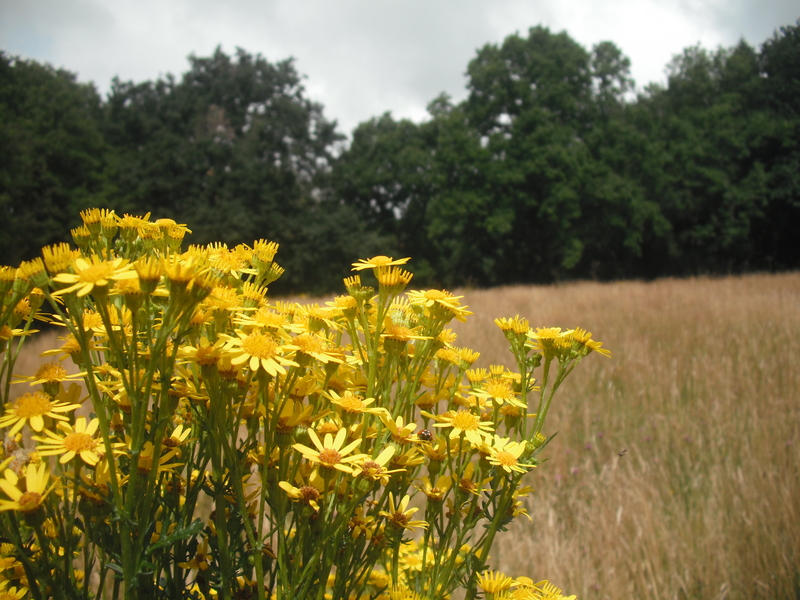 Ragwort – friend or foe? While crossing some beautiful meadows today to gain access to the woodland I came across some common ragwort (jacobaea vulgaris). My knowledge of this wildflower (also referred to as a weed) is limited, but I had been told it was poisonous to livestock. In a previous life as a volunteer with the National Trust I had spent a few days in the sun removing this so called weed from a field used by cattle for grazing. It’s quiet a stubborn plant to pull, and someone has invented a device (so called a lazy dog) to assist in the removal, think fork crossed with spade. In recent days I have started noticing this yellow/gold flower and the wildlife it attracts. Surely it can’t be all bad. I decided to give it a fair trial and find out more. My first bit of investigation tells me that ragwort is native to Ireland and the UK and belongs to the daisy family. The Irish name is “Buachalán Buí” translating as small yellow boy. It grows up to 1m tall and flowers from June-November. 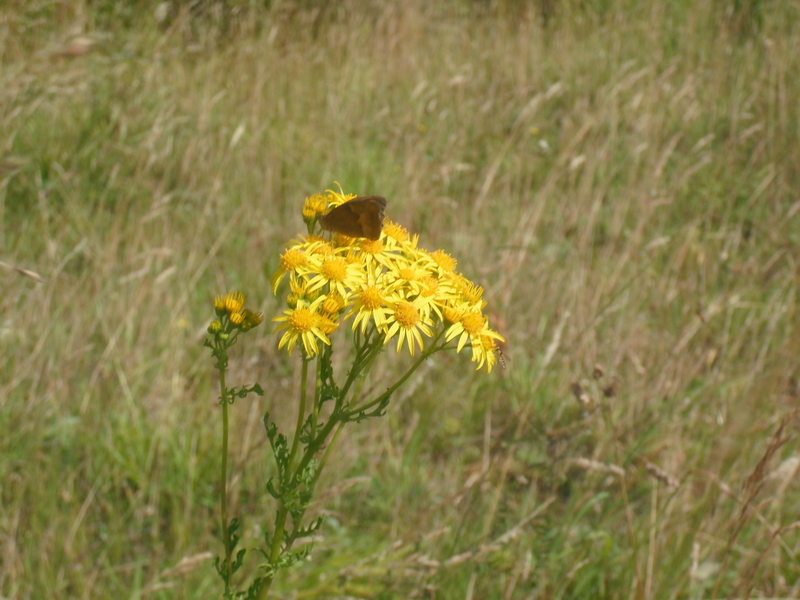 Ragwort is an important food plant for the cinnabar moth (Tyria jacobaeae). The adult is red and black and flys during the day – often mistaken for a butterfly. 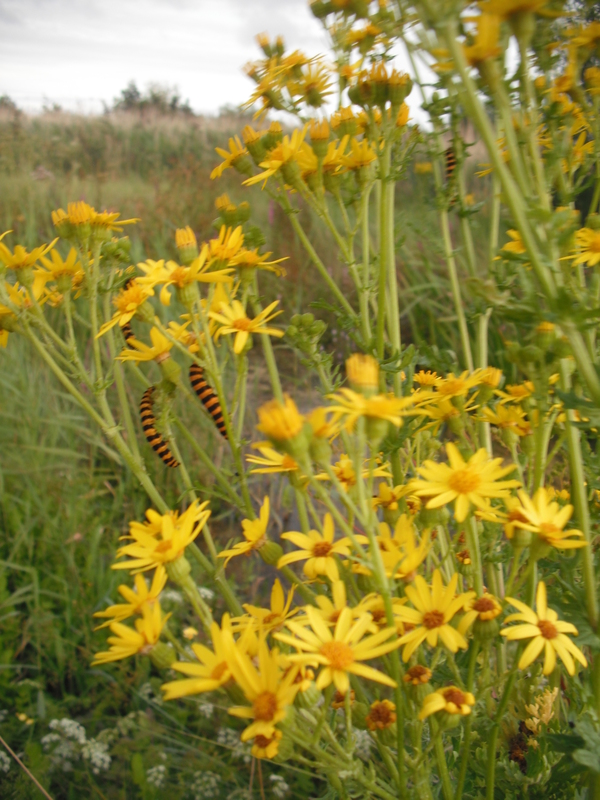 It lays eggs on the ragwort and the larvae (with black and yellow stripy jumpers) feed on the plant. It is an important source of nectar for many species. I’ve spied some butterflies (maybe a meadow brown) and ladybirds investigating the lovely flowers. In Ireland ragwort is listed in the Noxious Weeds Act, which came into effect on January 1st 1937. It contains alkaloids which damage the liver of farm animals who consume it. Livestock usually avoid eating it, unless other grazing is scarce. Further reading finds that an animal would need to consume a large amount of ragwort (between 5-25% of it’s body weight) for it to cause death. If you have ragwort growing on your land you can be “liable on summary conviction thereof to a fine not exceeding twenty pounds” [Noxious Weeks Act, 1936, Section 3]. Wonder what that would be in Euro? Throughout the years ragwort has been targeted using many means including cutting, spraying and pulling but these methods seem to have varying success rates. 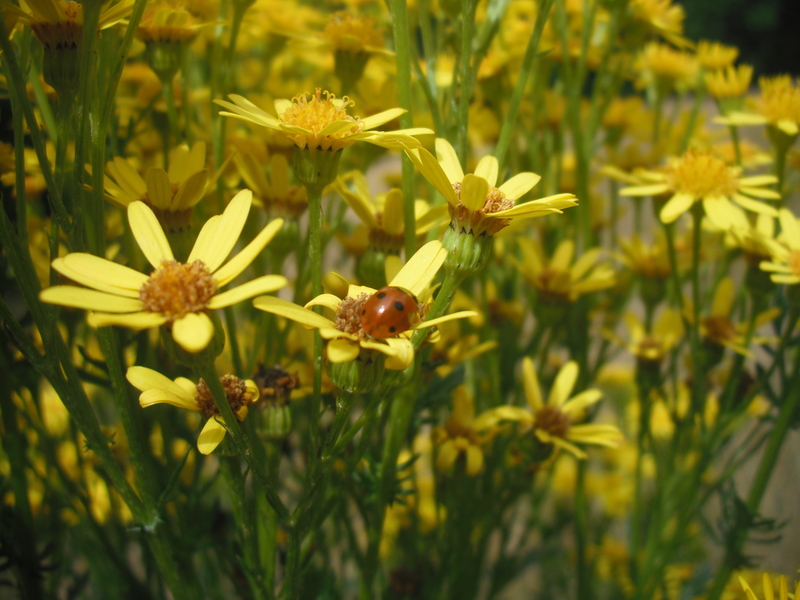 There are certain biological control methods which appear to work, including the ragwort flea beetle. Also sheep will feed on young ragwort plants, so grazing with a mixture of livestock may also be an answer. Overall – ragwort is a native wild flower and has an important ecological value to many species. In terms of agriculture it only seems to be an issue when the demand placed on the land in terms of grazing is too high. Its back in my good book, a friend for now, a tall yellow friend.